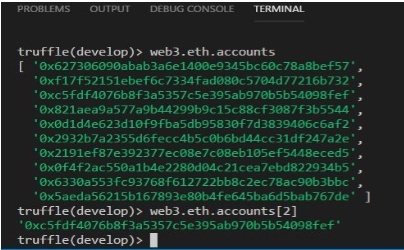 This is a step-by-step guide for developing an Ethereum-based cryptocurrency on Windows. VS Code integrates very well with Git for source control. Git is currently the best choice for source control. VS Code works well with Truffle framework that manages unit tests. 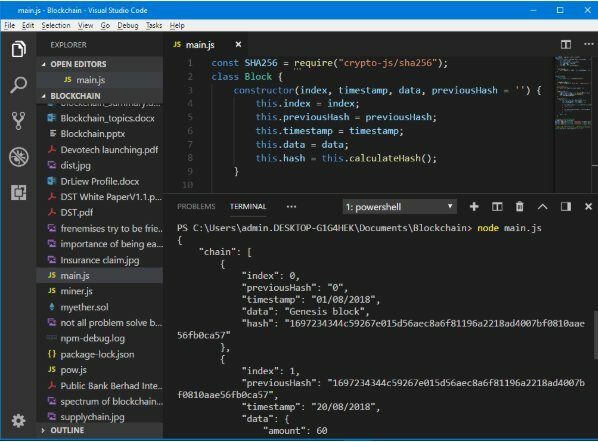 Besides that, Visual Studio code is a great tool for editing Solidity smart contracts and is available on Windows, Mac & Linux. *The Set-ExecutionPolicy changes the user preference for the Windows PowerShell execution policy. *Bypass-Nothing is blocked and there are no warnings or prompts. This execution policy is designed for configurations in which a Windows PowerShell script is built in to a a larger application or for configurations in which Windows PowerShell is the foundation for a program that has its own security model. * Why Chocolatey-“You’ve never deployed software faster than you will with Chocolatey.” -Rob Reynolds. Chocolatey is a software management automation. *iex-invoke expression-The Invoke-Expression cmdlet evaluates or runs a specified string as a command and returns the results of the expression or command. Without Invoke-Expression, a string submitted at the command line would be returned (echoed) unchanged. *A cmdlet (pronounced “command-let”) is a lightweight Windows PowerShell script that performs a single function. * https://chocolatey.org/install.ps1 downloads the Chocolatey installation zip file, unzips it and continues the installation by running a scripts in the tools section of the package. After installation completed, close and reopen PowerShell as administrator again. *Git (/ɡɪt/) is a version control system for tracking changes in computer files and coordinating work on those files among multiple people. It is primarily used for source code management in software development, but it can be used to keep track of changes in any set of files. As a distributed revision control system, it is aimed at speed, data integrity] and support for distributed, non-linear workflows. The output is as shown in Figure 1.
mkdir TruffleTest; cd TruffleTest; code . The final command in the chain is “Code .”, which opens an instance of Visual Studio Code in the folder from which the command is executed. 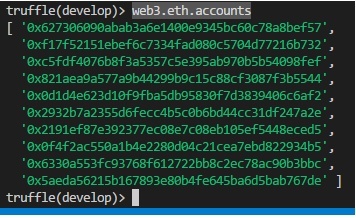 Now you have the VS integrated with PowerShell IDE for Ethereum Blockchain development. 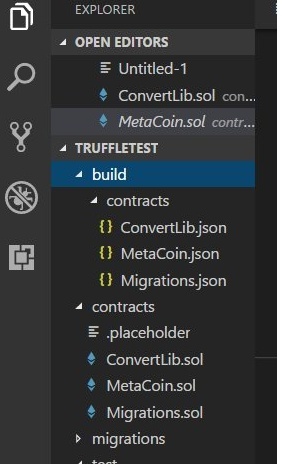 We will create a sample cryptocurrency and a smart contract using the built-in sample MetaCoin in Truffle. 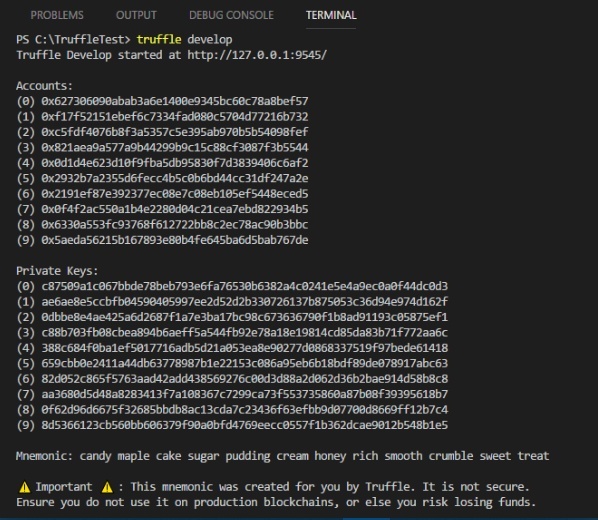 Now, download the files that can be compiled and deployed to a simulated blockchain using Truffle. The output should looks as shown in Figure 2. After downloading Truffle metacoin, we should be able to view two important application files written in Solidity, MetaCoin.sol and ConvertLib.sol, in Figure 3. *the Ethereum Virtual Machine is designed to serve as a runtime environment for smart contracts based on Ethereum. These two files can be compiled and deployed to a simulated blockchain using Truffle. *Or use truffle.cmd compile if there is error as shown in Figure 4. 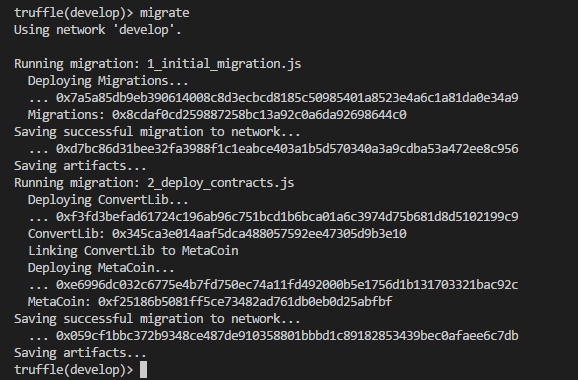 After compilation completed, You will notice that a ‘build’ folder has been added to the list of files, which contains the compiled json files ConvertLib.json, MetaCoin.json, and Migrations.json, as shown in Figure 5. 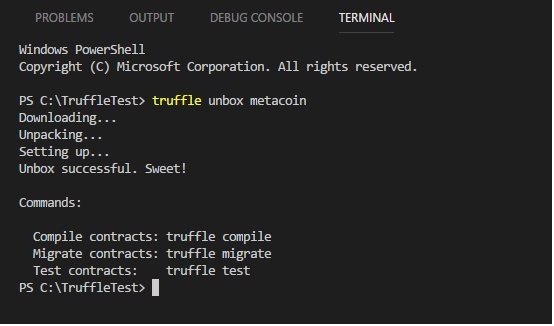 To deploy the contract, we shall migrate the contract to a test network in truffle development environment. The ‘develop’ command appears in the Truffle development console environment. This will set up a kind of dummy blockchain, that operates similarly to the real Ethereum blockchain, and allows us to test deployment and execution of the code without needing to interface with an actual blockchain. This command will launch the truffle development environment, automatically configured with 10 accounts and keys. The output is as shown in Figure 6. This will deploy the contracts to the test environment. The output is as shown in Figure 7. You will see the output as shown in Figure 8. The output is as shown in Figure 9. The output is as shown in Figure 10. MetaCoin, the constructor. It is called when the contract is deployed. sendCoin, for transferring coins between addresses. getBalanceInEth, to convert between MetaCoins, and Ethereum. getBalance, to show the balance in the requested address. * A constructor is a special method of a class or structure in object-oriented programming that initializes an object of that type. A constructor is an instance method that usually has the same name as the class, and can be used to set the values of the members of an object, either to default or to user-defined values. The output is as shown in Figure 11. The output is as shown in Figure 12. The output is as shown in Figure 13. The output is as shown in Figure 14. The output is as shown in Figure 15. The output is as shown in Figure 16. In the sendCoin() example, a transaction has occurred on the blockchain. This transaction can be stepped through line by line, using the Truffle debugger. 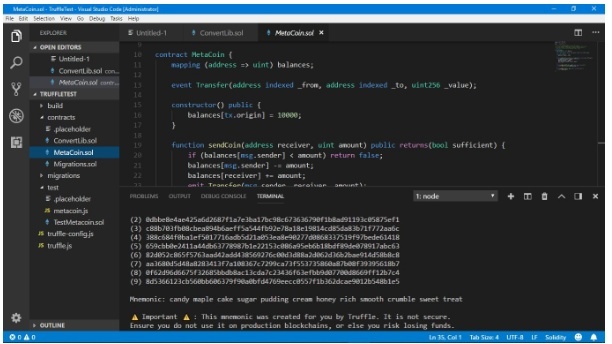 To do this , the Truffle debug command is used, passing in the transaction hash. This hash can be found in the console output following the sendCoin function call. This will start the Truffle debugger. The instructions for interacting with the debugger are printed to the console, as shown in Figure 17. As you step through the code, the values passed into the function will be shown. Note, these are ‘undefined’ at the start of the function call. You can press the enter key a few times to step through the code that was executed in this transaction. The output is as shown in Figure 18. The debug commands can be used to inspect the variables, and add watched variables, as shown in Figure 19. You can try to enter other commands. The output is as shown in Figure 20. Ganache output is as shown in Figure 21. 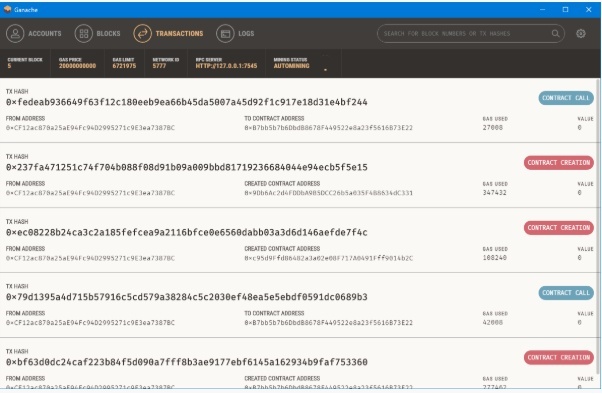 Click transaction and compare the transaction hash. They are the same. Run a node connected to Ropsten and specify the address of the default (first) account to unlock. You will be prompted for a passphrase. Rinkeby network is available only using geth client. Though we are experiencing crypto winter at the moment, with major coins devalued more than 80% in 2018, the underlying blockchain technology is still exciting. The blockchain provides a democratized trust, distributed and validation protocol that has already disrupted banking and financial services and is on the verge of overhauling other industries like healthcare, supply chain, HR and more. The main problem of storing data on a blockchain is the limitation of the amount of data we can store because of its protocol and the high transaction costs. As a matter of fact, a block in blockchain can store data from a few kilobytes to maybe a few megabytes. For example, the block size of the Bitcoin is only 1Mb. The block size limitation has a serious impact on the scalability of most cryptocurrencies and the bitcoin community is debating whether to increase the block size. Another issue is the high cost of the transactions. Why is storing data on the blockchain so expensive? It is because the data has to be stored by every full node on the blockchain network. When storing data on the blockchain, we do pay the base price for the transaction itself plus an amount per byte we want to store. If smart contracts are involved, we also pay for the execution time of the smart contract. This is why even storing kilobytes of data on the blockchain can cost you a fortune. Therefore, it is not viable to store large data files like images and videos on the blockchain. Is there a possible solution to solve the storage issue? Yes, there are quite a few solutions but the most promising one is IPFS. IPFS or Interplanetary File System is an innovative open source project created by the developers at Protocol Labs. It is a peer-to-peer filesharing system that aims to change the way information is distributed across a wide area network. IPFS has innovated some communication protocols and distributed systems and combine them to produce a unique file sharing system. The current HTTP client-server protocol is location-based addressing which faces some serious drawbacks. First of all, location-based addressing consumes a huge amount of bandwidth, and thus costs us a lot of money and time. On top of that, HTTP downloads a file from a single server at a time, which can be slow if the file is big. In addition, it faces single-point of failure. If the web server is down or being hacked, you will encounter 404 Not Found error. Besides that, it also allows for powerful entities like the governments to block access to certain locations. On the other hand, IPFS is a content-based addressing system. It is a decentralized way of storing files, similar to BitTorrent. In the IPFS network, every node stores a collection of hashed files. The user can refer to the files by their hashes. The process of storing a file on IPFS is by uploading the file to IPFS, store the file in the working directory, generate a hash for the file and his file will be available on the IPFS network. A user who wants to retrieve any of those files simply needs to call the hash of the file he or she wants. IPFS then search all the nodes in the network and deliver the file to the user when it is found. IPFS will overcome the aforementioned HTTP weaknesses. As files are stored on the decentralized IPFS network, if a node is down, the files are still available on other nodes, therefore there is no single point of failure. Data transfer will be cheaper and faster as you can get the files from the nearest node. On top of that, it is almost impossible for the powerful entities to block access to the files as the network is decentralized. The following figure shows the difference between the centralized client-server protocol(HTTP) and the peer-to-peer IPFS protocol. IPFS is the perfect match for the blockchain. As I have mentioned, the blockchain is inefficient in storing large amounts of data in a block because all the hashes need to be calculated and verified to preserve the integrity of the blockchain. Therefore, instead of storing data on the blockchain, we simply store the hash of the IPFS file. In this way, we only need to store a small amount of data that is required on the blockchain but get to enjoy the file storage and decentralized peer-to-peer properties of IPFS. One of the real world use cases of blockchain and IPFS is Nebulis. It is a new project exploring the concept of a distributed DNS that supposedly never fails under a overwhelming access requests. Nebulis uses the Ethereum blockchain and the Interplanetary Filesystem (IPFS), a distributed alternative to HTTP, to register and resolve domain names. We shall see more integration of Blockchain and IPFS in the future. First of all, let’s examine the content of a block. A block consists mainly of the block header containing metadata and a list of transactions appended to the block header. The metadata includes the hash of the previous block, the hash of the block, timestamp, nonce, difficulty and block height. For more information, please refer to my earlier article Blockchain in a Nutshell. The installations are based on Windows 10, but you can do the the same thing easily in Ubuntu. Chocolatey is a software management solution for Windows, Visual Studio Code is a streamlined code editor with support for development operations like debugging, task running and version control and Node.js is an open source server environment. SHA-256 is a cryptographic hash algorithm. A cryptographic hash is a kind of ‘signature’ for a text or a data file. SHA-256 generates an unique 256-bit signature for a text. SHA256 is always 256 bits long, equivalent to 32 bytes, or 64 bytes in an hexadecimal string format. In blockchain hash, we use hexadecimal string format, so it is 64 characters in length. The class Block comprises a constructor that initializes the properties of the block. Each block is given an index that tells us at what position the block sits on the chain. We also include a timestamp, some data to store in the block, the hash of the block and the hash of the previous block. 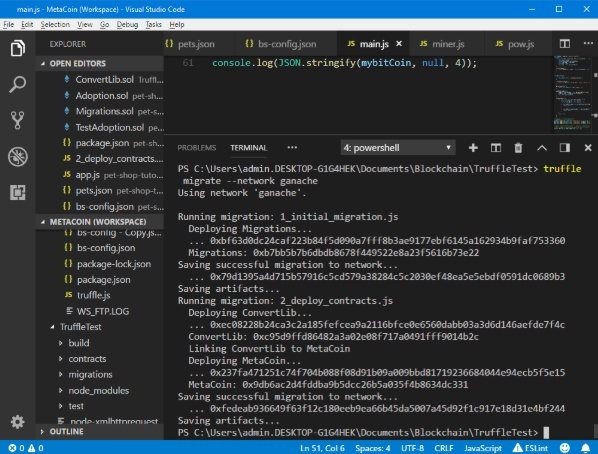 Notice that the class blockchain comprises a constructor that consists of a few functions, createGenesisBlock(), getLatestBlock() and addBlock(newBlock). Save the file as myblkchain.js or any name you like. Let’ examine the output. Notice that each block comprises the properties index, previous hash, data and hash. The index for the Genesis is always 0 . Notice that the hash of the genesis block and the previous hash of the second block are the same. It is the same for other blocks. Let’s examine each one of them. This is an HR blockchain platform designed to improve the recruitment process as well as payroll. It claimed that it will disrupt the HR industry similar to how Uber has disrupted the taxi industry. ChronoBank ecosystem comprises a hiring platform(LaborX), a decentralized exchange(TimeX), a multi-signature wallet(Chronowallet) and a cryptocurrency that is pegged to labor hours(Labor Hour token). LaborX is their flagship global hiring platform that connects candidates to the companies. It features an industry first immutable reputation system and a crypto payment system based on smart contract. The reputation system allows faster screening of candidates therefore save time and cost in hiring the right candidates. In addition, the crypto payment system enables candidates to get paid on time. Furthermore, it plans to use a stable coin as the crypto payment to eliminate volatility common in most cryptocurrencies. This coin is known as Labour-Hour tokens. These tokens are linked to average hourly wages in the host country and are backed by a real labor force from big recruitment and labor-hire companies. Labor is considered a tradeable resource so ChronoBank will tokenise this resource into the LH-Tokens. PeaCounts is a blockchain-based payroll system. PeaCounts claimed that their payroll system will revolutionize the way employees are paid by using blockchain to remove the trust-based elements of the payroll process. It ensures the employees will get paid as soon as the work is completed. On the other hand, the employer will pay just for the work completed. It features a smart contract that can track an employee location and time spent on certain tasks. It also holds the PEA Tokens and release them to the employee upon completion of the tasks. This system ensures that the employee gets paid efficiently and fairly. The PeaCount payroll system is a private blockchain created as a fork off the Bitcoin. It also implements the zk-Snarks protocol and a multi-access wallet to ensure security in payroll transactions. bitWage is a payroll and HR services platform designed for the digital age. Basically it is a global outsourcing platform that serves the freelancers who wish to seek jobs worldwide and employers who wish to hire remote workers . The bitWage payroll system allows employers to pay their remote employees rapidly with low transactions. The employees have the option to receive their wages and salaries in any of twenty four fiat currencies, four cryptocurrencies , and four precious metals. Blockchain secured eDelivery and document exchange. Human resource management has undergone tremendous changes in recent years particularly with regards to digitalization of human resource. The emergence of blockchain technology could further transform the world of HR. According to Griffiths(cited in Gale, 2018), blockchain has the potential to streamline a lot of inefficient work related to employee data verification. Blockchain can store a candidate education, certifications and work history in a single ledger, therefore it would take just minutes rather than days to verify the data. Besides that, the data cannot be modified or hacked once they are stored in the blockchain, thus guarantee data security and trustworthiness. In addition, blockchain has the potential impact on HR by allowing personal data to be owned by the individual rather than the organization(Mike, cited in Gale 2018). Consequently, every employee could maintain control over their entire employment data, including educational background, training, and work history. It also means that an individual work identity is more portable, it moves with the individual rather than stuck inside the former organization when an employee changes job. Besides that, blockchain could disrupt conventional HR processes with respect to financial transactions. Blockchain could streamline payroll function significantly by allowing automated and direct payment based on smart contarcts, without the need of a third party such as a bank or other intermediaries. Recently, PWC (2018)has identified a few areas where we can apply the blockchain technology in HR. The areas include talent sourcing and management, targeting productivity gains, cross-border payment and mobility and Fraud prevention, and cybersecurity and data protection. Blockchain could have a major impact on talent sourcing and management. It allows employees to maintain and control access to a comprehensive, trustworthy blockchain-based record of their education, skills, training and workplace performance. By providing potential employers with access to their blockchain-based employment data, companies would be able to match individuals to roles much more accurately and effectively. Blockchain has the ability to better match people’s skills and performance to jobs. Finding and recruiting the right talent is always problematic for business organizations, therefore by helping them do this more effectively and efficiently will surely boost their productivity. Besides that, blockchain can help to reduce the burden of data-intensive processes like payroll and VAT , allowing companies to focus more on their core businesses. Multinational companies could create their own blockchain-based corporate cryptocurrencies that they can use for cross-border payment across their global supply chains, without the need of third-parties for settlement and reconciliation. In the future, central banks may legalize this type of cryptocurrency and support convertibility into fiat currencies. In addition, blockchain could facilitate employees mobility across the border with respect to payroll adjustment, international expenses, and taxes. HR department usually needs to handle high-volume financial transactions and sensitive personal data, therefore it is utmost important to prevent frauds as well as to safeguard the data. This is the area where blockchain could be extremely useful. Blockchain’s use of consensus to authenticate data can help to eliminate frauds. Another issue that blockchain can help to overcome is cyber threats. Many SMEs are ill-prepared for cyber attacks and the results could be detrimental to their businesses. Blockchain could help ensure cybersecurity as the data are immutable and tamper-proof because it uses SHA-256 hashing cryptography. How to leverage digital transformation to improve employee experiences?